PlayStation 4’s parentals controls allow you to restrict the type of content your children can view based on maturity, the internet browser and chat with other users on the PlayStation Network. Also you can filter out inappropriate content from the Store. On the main menu go to the Settings menu and scroll down to Parental Controls/Family Management then select PS4 System Restrictions. The first step is to Change System Restriction Passcode, so that your child can’t change these settings. If your child is the only person using the PS4 then you can also stop new users from being created and disable the guest user, this will mean that the parental controls will be for the entire console no matter who’s using it. 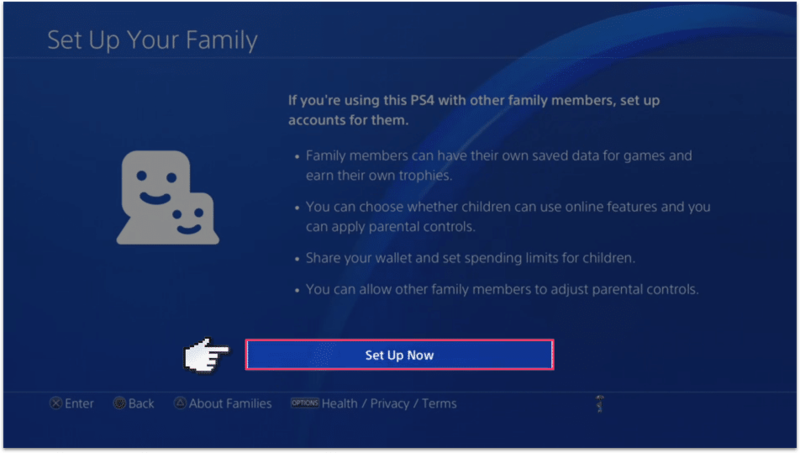 If there are other people in your house that are going to use the PS4, then go back to the Parental Controls/Family Management section and this time choose Family Management. Choose Set Up Now to get the process started and, if you haven’t already, it will ask you to verify your email address. Next, create a user for your child, select the Create User button and then enter your child’s name. Then you can set up parental controls just for your child’s user. First, select Age Level for Games and choose the most appropriate age, you can do the same for Blu Ray’s as well. The PlayStation network allows your child to play games and interact with other PlayStation users online. Choose Allow here and you’ll be able to set some limits for that in the next step. Set up the restrictions you want for the PlayStation network, check out this guide for more information on how to do that.